I’m following up as promised. 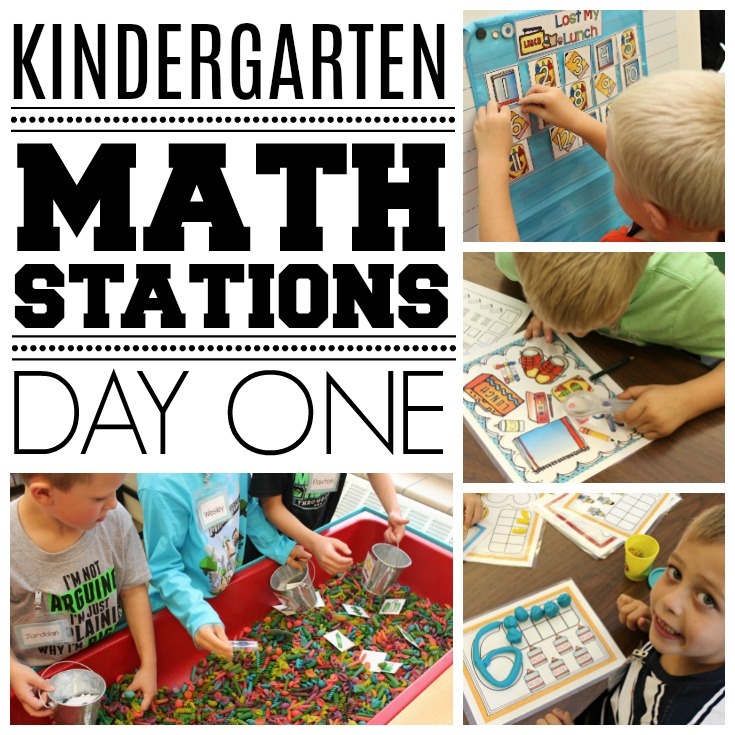 Last week I gave you some detailed steps on how to set up and organize your stations with my post, Setting Up Math Stations For A Successful Year. This week I wanted to let you know how I introduce them and what the reality of first day math stations actually looked like in my classroom. This is probably the question I get most often from teachers. How in the world do you introduce math stations? What’s the secret? I can’t really tell you that there is a fail-safe secret or magic formula. The first thing you have to consider are the resources you are trying to introduce and your students. This year, I have a class that ranges from 4 years old to 6 years old. Some have had 2 years of preschool. Others have never been in a school setting or even a daycare. I knew, especially for those little ones, that I needed to go slow and model, model, model. Before we even broke into the math station drawers, I took some short pieces of time (no more than 5-8 minutes if possible) and introduced the activities one by one as a whole group. For example, with the game ‘Lost Lunch.’ I had set up the game and had the entire class turn their bodies while I hid the lunch box behind a number card. Then I had students take turns guessing where the lunch box was located. It took about 8 minutes, but everyone in that class knew how that game worked. When it was pulled out during math stations the next day, I didn’t have to do anything but show them the visual cue care and they knew exactly what to do. 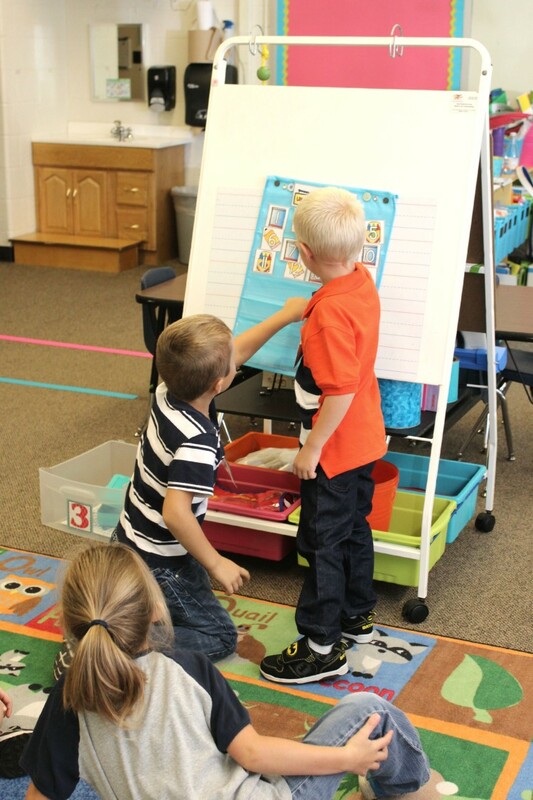 For the I-spy stations and the counting mats, throwing the mats up on the document camera is another way to introduce the activities before hand. Remember, you don’t have to introduce them all at one time. When you have a few minutes here and there, take the time to show them one. They may not remember EVERYTHING, but they will be familiar enough to have a good idea, and you also have the visual cue cards to help. So my first day of math stations, after having introduced all the stations the days before, was Friday. On Friday, I pulled out the first 6 stations and placed them around the room, on tables, on the floor . . . we are never JUST at tables in my class. I then pointed to each name and each number reading off the number each ‘team’ would attend and where it was located. One at a time, I dismissed each team to their stations until all teams where at their assigned station and they could start. Will I do this each time I have stations for the rest of the year? Goodness no! I do this for the first couple of weeks, and then gradually, they are challenged to figure out their stations on their own. But in the beginning, since some of these kids have never even experienced stations, this was a good way to dismiss them to start their work. I was able to get pictures of most of the stations in action that first day. (That was a minor feat in itself I’ll have you know. Have you ever tried to set up the first day of stations, keep them going AND take pictures? Multitasking at it’s finest I’m telling you. I gave myself a pat on the back.) You’ll see that while the stations are not running as perfectly as possible, students are pretty engaged and on task. That’s good enough for me on the first day. As long as students are using the materials correctly, no one tried to move stations and students are engaged, I’m happy . . . we are making progress, because it’s the first day for goodness sakes. Remember this was the activity where they would be sorting cards by color. I wanted something simple to teach them routines and procedures at the sensory table. Students shared and worked together. I had a hard time getting them to let go of the sorting buckets. I’ve never had this problem before. I usually set them out so that a student pulls a card and then files it into the correct bucket lined up on the window sill. This group wanted to be in charge of their own bucket and only find that color of card. Not a big deal. I was kind of impressed they figured out to do it that way, but not exactly the directions. Because the table is new and exciting, it can get a little noisy. 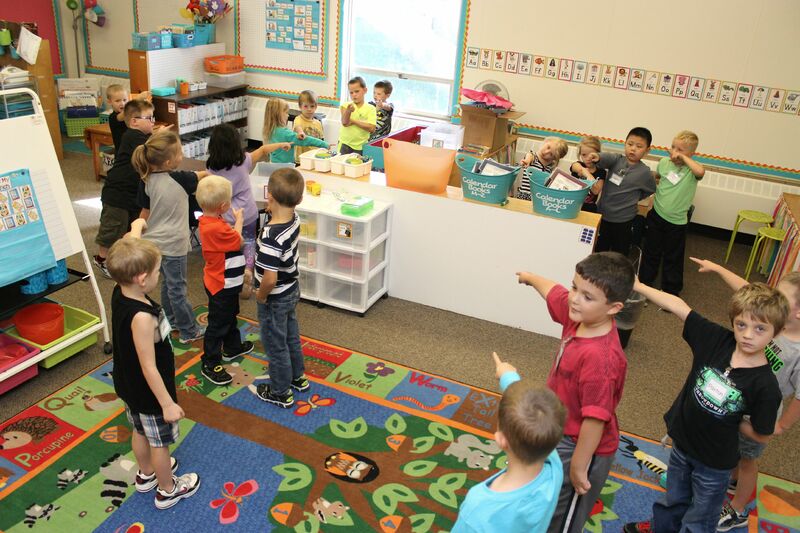 Luckily, I work on the premise that math stations, when kids are engaged and working together, will be noisy. I think it will work itself out with reminders the more they go to that station. 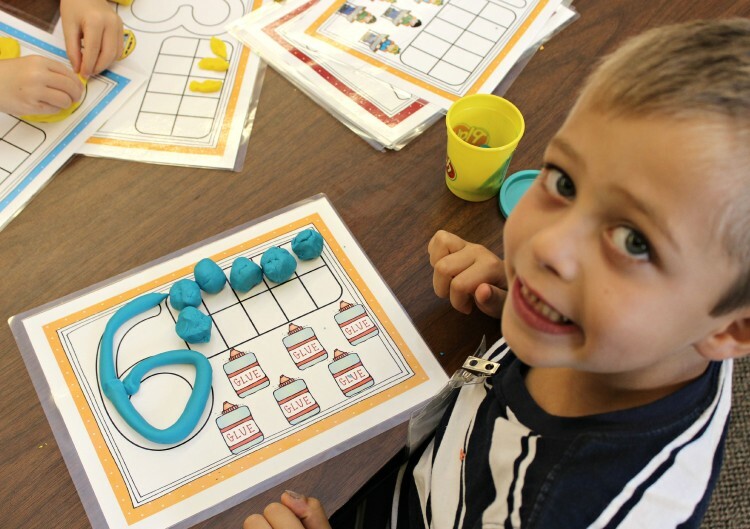 Students were to go to this station and produce numbers using play-doh, and then show the number as represented by a tens frame. Completed the task as directed. Clean up was well done. Just my pet peeve, but I hate a cluttered work space. This is all new though so you’ll see that the unused number mats aren’t stacked in the middle of the table. They are all hither tither all over the place on that table. That bugs me. Man, do they need to build those little muscles. Some of them had the hardest time rolling a play-doh snake to make the letters. Just tells me I need as much fine motor as I can get. 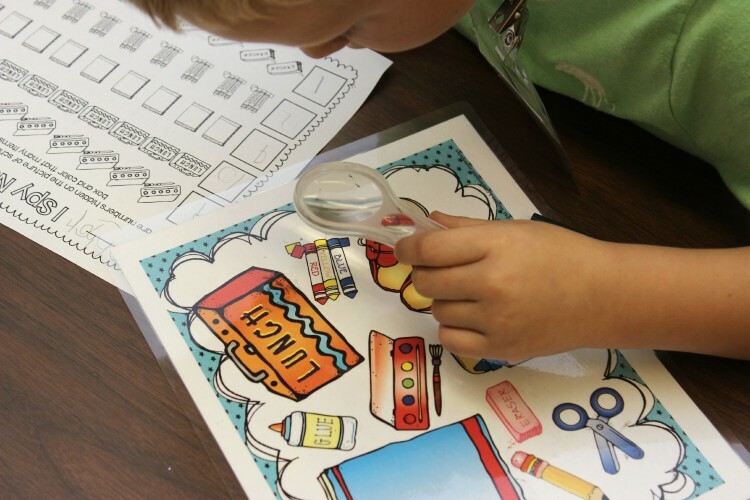 Students use the magnifying glass to search for numbers, then write them next to the pictures on the recording sheet and color that many of the item. I was able to see students who may not have known the number, actually look at the number posters in the class to figure them out. Half the battle of teaching is helping a student figure out where they can find the answer. 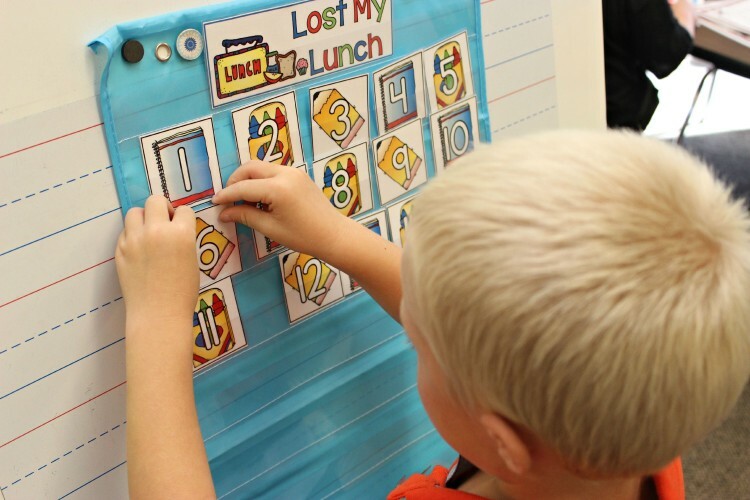 If they are already figuring out that there are number posters in the class and they can use them, that makes me very happy on day three of school. These math stations were shorter than normal, because it’s the beginning of the year and they just don’t have the stamina yet. Because of that, some students were frustrated that they couldn’t finish, even though I assured them they would be coming to that math station again. Good problem to have, but still a problem. 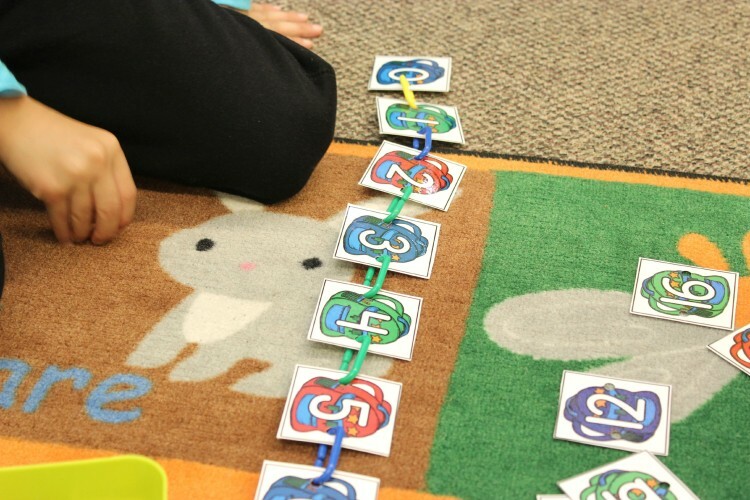 Students use plastic links to link the numbers in order. Once again, I saw students using the resources in the room to help them figure out number order. Yippee! Some students did the activity with the numbers going in the correct order, but from right to left instead of left to right. Students were not happy when they ran out of time and couldn’t get all the numbers put in order. I assured them they would do this activity again, but they wanted to finish. Despite having placed the two teams of students on opposite ends of the rug, their materials got mixed together and the work space was not real neat. 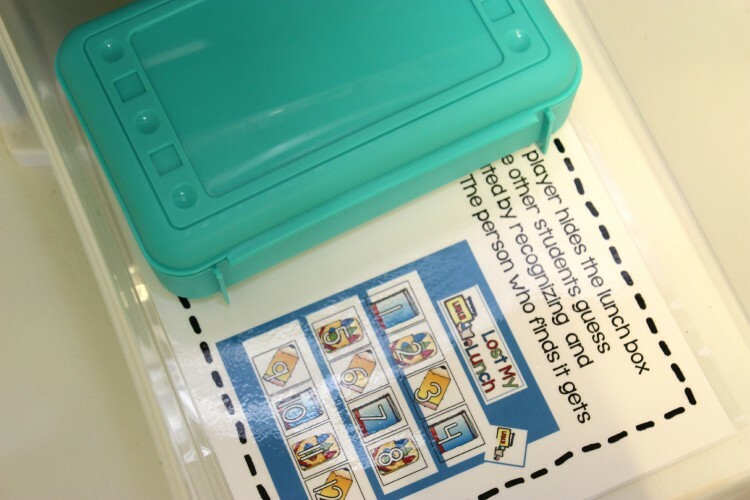 Students hide the lunch box while other students guess where it’s located. Students followed the rules of the game. No one got upset if they didn’t guess correctly. 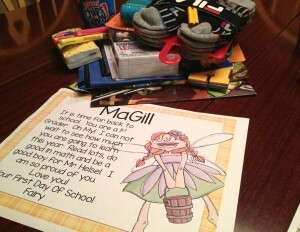 I really can’t wait to get my kids to the point where they are ready for me to differentiate. They need a couple of weeks under their belt to know how to manage materials, but this is a perfect example of how I need to differentiate as soon as possible for those kids that are ready for more of a challenge and those that have not yet mastered 1-10. 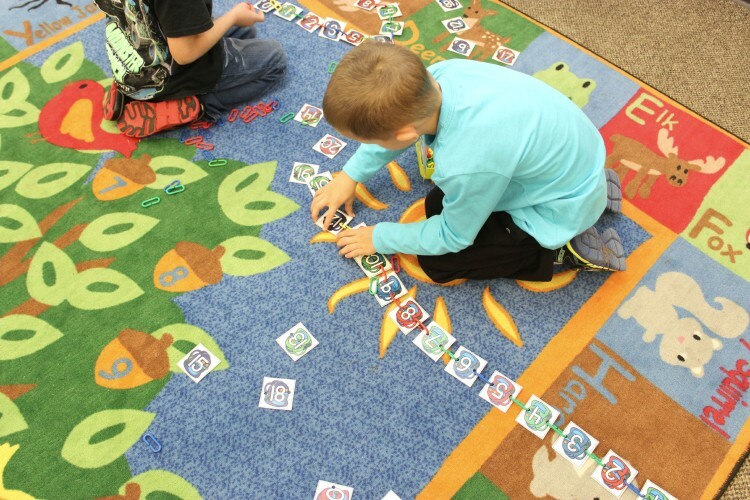 Students use the counting mats to count and record their findings. This isn’t an easy station to get started, but they handled it quite well. I saw students helping eachother with the instructions, before having to ask me. Again, because we are not up to full speed, work does not get completed and while that doesn’t bother me, students don’t realize that they will finish their papers when they visit this station again. Many students are struggling with pencil grip. 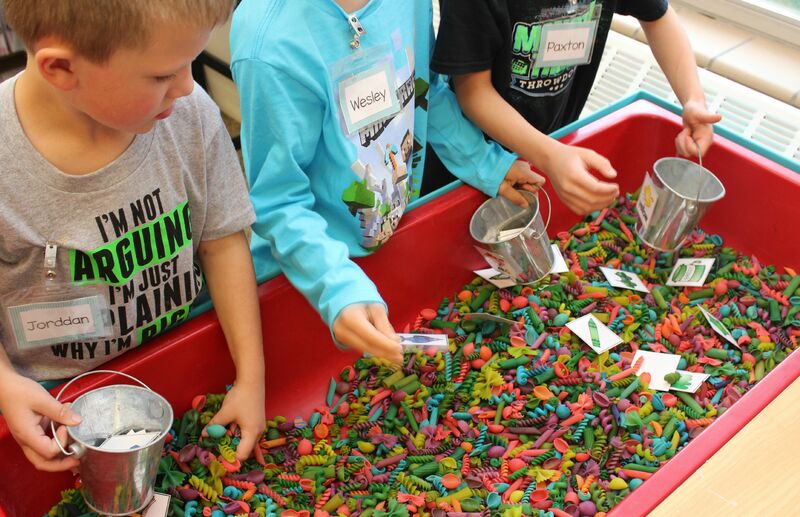 It’s going to be really important to give them many opportunities to build those fine motor muscles. 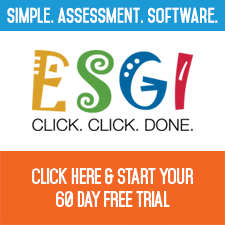 Once that first set of math stations was completed, what happened then? Well in my class, we do two sets of math stations each day that we have them. So I needed to show students how to figure out where their next station would be. Once I ‘classity class’-ed them and stations were cleaned up and ready to go, I had them watch me as I moved the numbers on the chart down. This way they could see how they would no longer be a 1 for instance. Now they were a 9. Or they were no longer a 2. They were now a 1. Then we talked about how we could find our math stations in the room by finding the drawer with our number. With them all standing up, we found and pointed to our corresponding drawer. That way when it was time to move, I knew and they knew exactly where they were going. Boom! Worked like a charm. Will I be doing this every time we have math stations for the rest of the year. Absolutely not! But for these first few weeks, I will do it and then gradually give them more and more power to take this responsibility over for themselves. So that’s not all the stations yet. I missed getting a picture of a couple, and we still have a couple that we haven’t used yet, but I promise I’ll get back to you with those as well. I think the most important thing to remember as you get started with the stations, is that these first few weeks is all about getting a routine, procedures and working out the kinks in transitioning. If you don’t practice those routines, you’ll end up having to start over again and again, so do the front loading and get it down now. And the same goes for teaching, the more you practice introducing stations, setting them up and working on routines and transitions, the better you become at it too. Don’t be too hard on yourself. Celebrate the successes and note the areas where you need to improve. Goodness knows I have to re-evaluate myself regularly. I really believe that in a few weeks (Dare I say, maybe even less), you will be up and running like a well oiled kinder machine. Remember to leave me any comments or questions you might have. 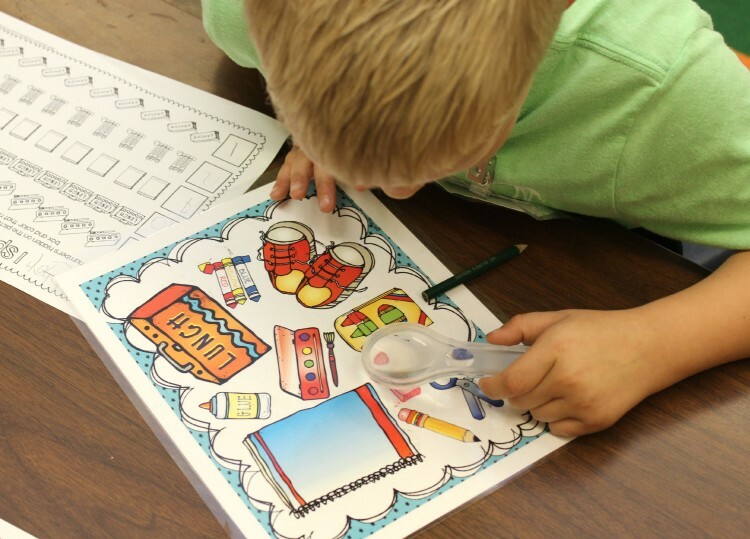 I’m going to be following up on the rest of these beginning math stations and showing you how I use assessments to plan for my next stations in my next math stations posts, so stay tuned. What are you doing while kids are working at centers? At the beginning of the year, I’m managing. They are NOT ready to be completely independent yet. I will continue to manage and monitor until I think they can handle it on their own. It usually takes about 3-4 weeks. Once I’m confident with their abilities to stay on task, I can start to do small group intervention/guided math as needed. What do they do with their unfinished sheets for that station? You mentioned they will get to come back and finish. I have a poly envelope for them to store them in within that drawer. When they circle back for their second visit to that station, they can finish it up then. I pin all your station management pins and come to your site because I struggle with stations/rotations/centers in a bad way! But . . . I keep at it because I know how important it is. I launched my Daily 5 (3) rotations and when a teacher came it she said, “oh my god!” How did you get them all working doing their own activities and they are even quiet. 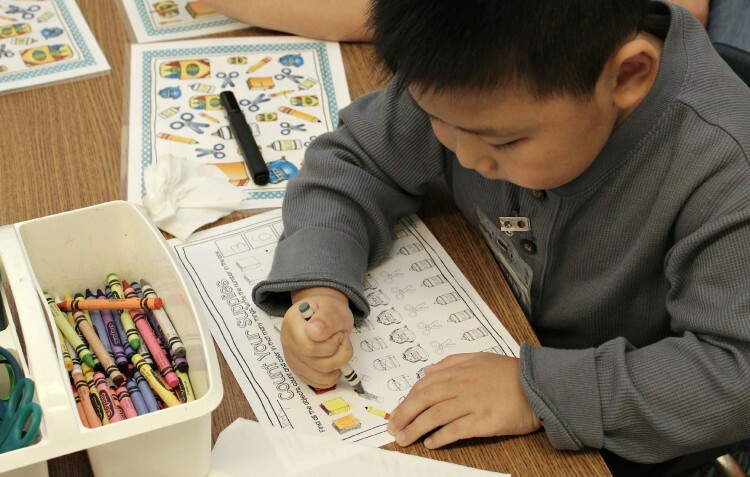 My response, well, after my observation, where I taught whole group and 5 of my 22 kids had such a hard time, I went back to what I know is best for kids and what makes them happy!” Other kinder teachers kept telling me you can’t do centers in kindergarten, they are not independent enough – maybe later. 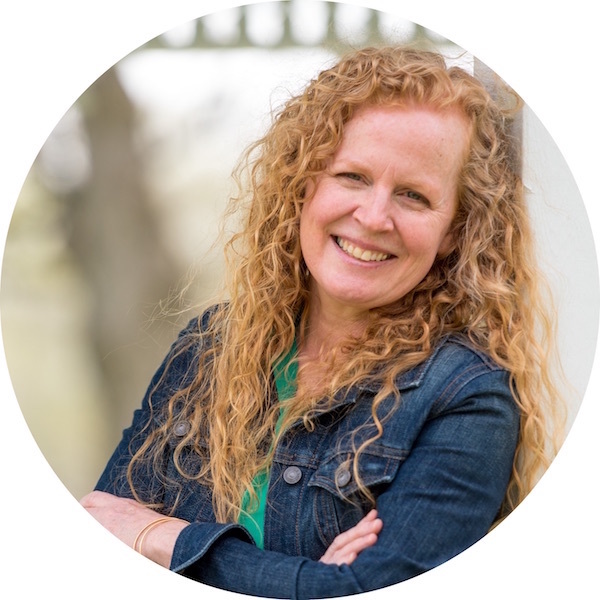 I listened to them and after my observation – I was done with whole group guided direct instruction. I do some whole group direct guided instruction but not a lot of it. Thanks for your posts, I appreciate them! Thank you so much for sharing Tonya. I’m so glad they have helped. Do you have trouble with traffic jams when all the tubs are in one spot? No because the stations are spread out throughout the room. They are only stored in one spot. Wow! I’m obsessed with your blog and TPT store. 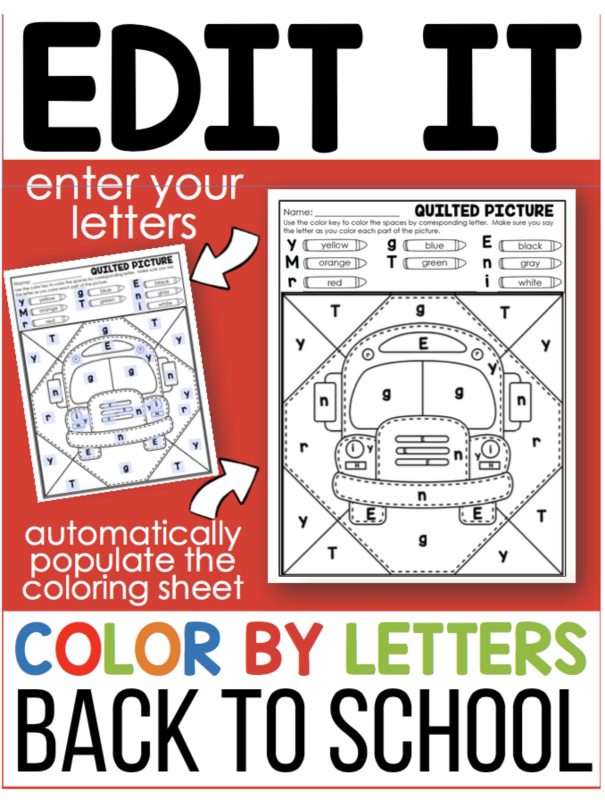 I love how your activities pretty much stay the same direction- wise but the numbers, words, letters, theme, etc. change. I think that is winning half the battle. I struggle with teaching my kids a new game with new directions every day and their biggest hurdle is just getting the directions down, forget learning the skill. I teach first grade so some of the skills you have in your packs I could definitely use for the beginning of the year and for my low babies. I’d love some geared more towards first grade skills. I wish you had them! Can you suggest any sellers that have that similar style of same directions, different skill? 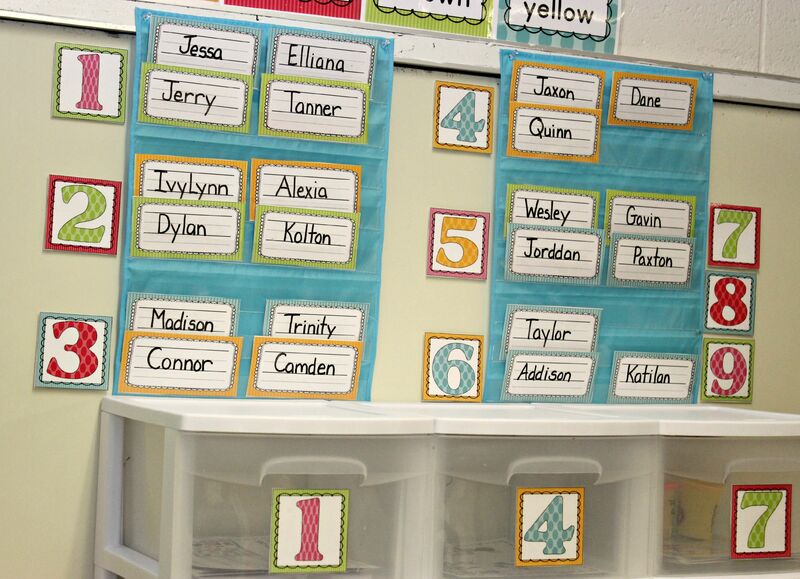 Do you have designated areas in your classroom for each math tub? If so.. is that area labeled as well? or do students take the tub where ever they want? No. The tubs are moved to whatever location serves it best. Some activities are best used on the floor, others a desk . . . it depends on the child and the activity. What are you doing during math on the days you do not do math stations? When do you teach whole group math instruction? I’m curious the time you have allotted for math instruction along with math centers.